Clearly people love to sing Georgia’s praises — no surprise because there is a lot to adore about our state. And Georgia Crafted founder, Erin Zwigart, has a passion for discovering even more to love. This Smyrna mom scours the Peach State every month to curate the best locally made products and delivers them straight to your door via a subscription service. There have been several times over the last few years when I wanted to put together a local, hand crafted gift for someone, highlighting what our artisans have to offer in terms of food, art, apparel, and more. But if there’s one thing I cannot do now that I have two small children, it’s spending a few hours hopping from boutique to craft store to bakery to farmers market collecting all of the items for a gift. I think of how easy it is to find an abundance of “local-pride” type items in one place in my hometown of New Orleans and have often wished wished there was something similar here. It turns out there is – except instead of a store, these great products are offered via a subscription service or as single-order gift sets. 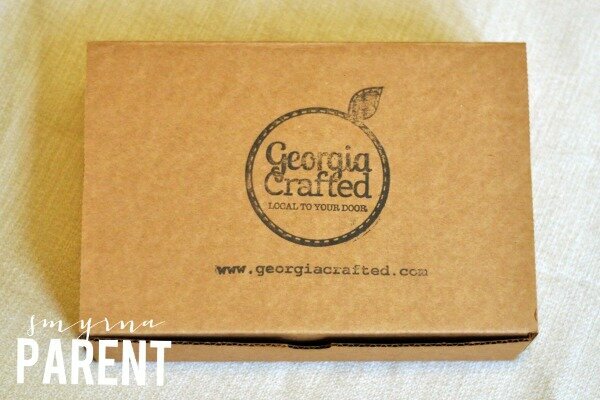 If you’re interested in the “Georgia Grown” gift boxes, you can sign up for a 1 month, 3 month, 6 month, or recurring subscription (think Kiwi Crate, Citrus Lane or Birchbox but locally sourced). Each box is a surprise with 4-5 items from around the state. A sticker on the inside top of the box describes the product, where it’s from, and a bit about the company. 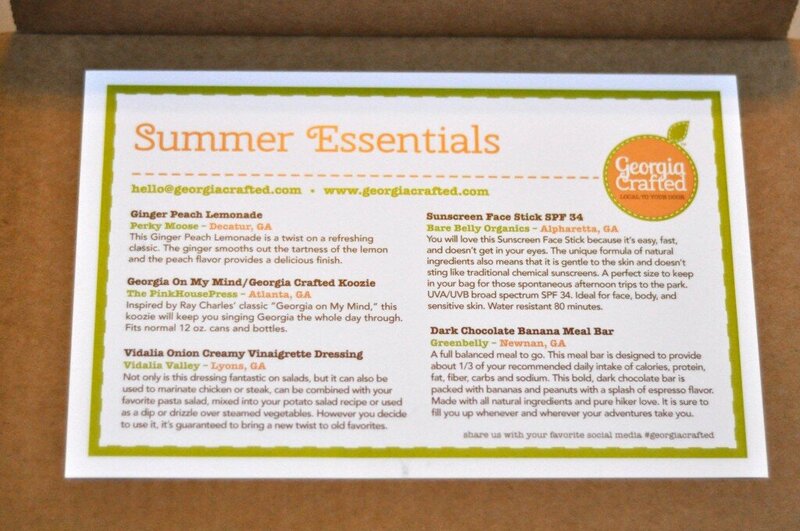 Erin was kind enough to provide me with the August “Summer Essential” themed gift box for this review. It included Ginger Peach Lemonade powder (Decatur), Vidalia Onion Creamy Vinaigrette Dressing (Lyons), Sunscreen Face Stick (Alpharetta), a Dark Chocolate Banana Meal Bar (Newnan), and a Georgia on my Mind koozie (Atlanta) which perfectly captured the theme of the box. Other themes for the subscription service and the individual gift boxes have included Chocolate (yes, please! 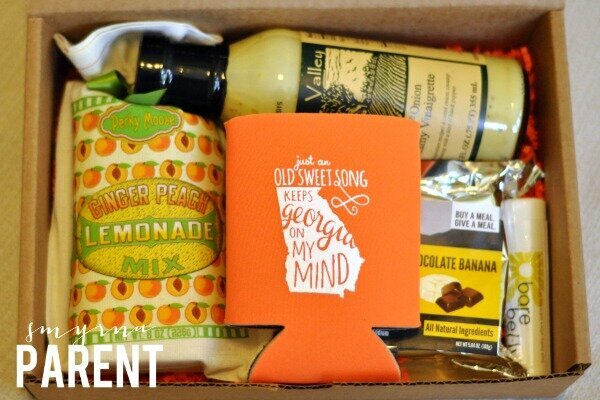 ), Southern Gentlemen, “Get a Head Start” Breakfast Box, Savannah Gift Box and the latest one: It’s Fall, Y’all! Even if a monthly subscription isn’t your thing, Georgia Crafted can still be your go-to for gift giving. If you find yourself needing a unique gift quickly, you can visit the website, select your gift box from several themes, and it will ship in just a day or two. They also offer corporate gift boxes, which will be personally curated based on your needs and budget, packaged and shipped to your customers. Finally, if you just loved something you saw in a prior box, you can shop for specific items on the online store. It’s simply a great opportunity to celebrate our great state, support local artisans, and discover new products all at once. To sign up or learn more, visit the Georgia Crafted website. Also, follow their Facebook page for updates on the upcoming boxes, specialty products, and more.